Several gateways serve the Seychelles, including Dubai (which continues to increase the frequency of direct flights), Abu Dhabi, Nairobi, and more. 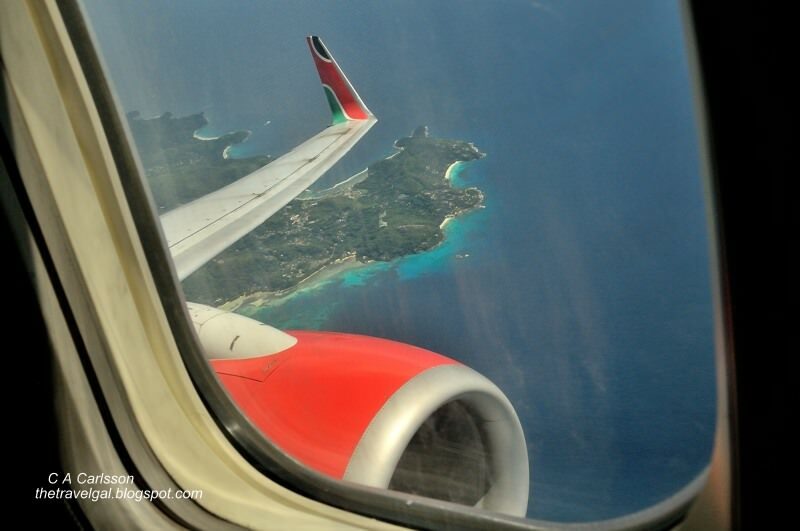 Flights are available on a number of airlines, including international carriers and Air Seychelles. We flew business class using frequent flier miles, which let us travel in relative comfort for the price of coach ticket, but on a slightly more convoluted routing through Chicago O’Hare (Dulles on the return) on Delta, Paris on Air France, and Nairobi on Kenya Airlines in order to get to the marina in Mahe, Seychelles. All of our flights went smoothly, including the dreaded plane change at Charles DeGaulle in Paris, although our luggage apparently missed that connection (thank you Air France). Seychelles Air provides service from Mahé to Praslin, Denis, and Bird Islands. Helicopter service, including aerial tours, is also available in some areas and to a number of high-end resorts. gorgeous photo! i absolutely love sitting in the window seat so i can look out and see new destinations right before we land. its such a fabulous way (albeit free, well, after the flight is paid off!) to see a place from high up. thanks for sharing!